The food and beer at The Crossing public house in Burton upon Trent is very good. Both burger and chips appeared to have been cooked to order and the burger of their own making was very tasty. 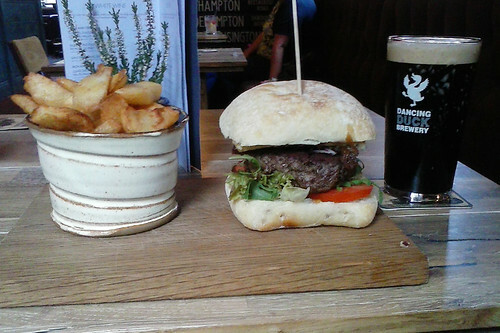 The bun was Chorley Wood process bread, but bread of any other sort in restaurants or pubs seems a rarity. The beer, Dark Drake by the Dancing Duck Brewery, was also very much to my liking. But when the bar staff asked if I would like any sauces to go with the burger, any answer but ‘no’ seemed to be courting disaster. Where would any surplus sauce flow? The rim on a plate is not just a decorative item, it serves a purpose: of keeping any food or liquids thereupon in place. A flat plank of wood, however fashionable it may be in the eyes of the pub manager, is just not up to the task of keeping sauces near the food rather than in the lap of the customer. Swindon Borough Council’s latest ‘scores on the doors’ news release has received plenty of publicity. But whilst the complacency of some of those in receipt of a zero star rating is to be deplored, the criticisms of the scoring by some more highly rated* cannot be ignored. The criticism is that the inspection regime is too paper based: an establishment can fail for not filling in the right paperwork, but can pass with poor hygiene if the paperwork is fine. risk of contamination of food. confidence in management and control systems. Serious non-compliances found but no imminent risk to public health. Until there’s an inspection regime that’s concerned more about food hygiene than it is about correct paperwork, my choice of restaurants will remain undisturbed. * At which point I would have liked to have linked to their five star rating, but the council’s search result was broken. As I’ve noted elsewhere, one of the less pleasant experiences when stepping out from the Brunel Centre into Havelock Square is the rather sickly smell of cooking doughnuts. That said, I wouldn’t wish to deny anyone visiting Swindon town centre their dose of doughnuts, just not in such a cramped location. Swindon Borough Council has taken a different view, refusing licenses for both the doughnut seller and a hot-dog stall. Hot food trailers and vans tend to function as portable shop units, operating in isolation. Where it appears that they are being used (or will be used) principally to save on costs relative to competing cafes and take-aways, a street trading consent will not normally be granted. Where the infrastructure or trading opportunities are such that a fixed retail unit could not be justified or accommodated, a fast food trailer will be considered for consent. ’Tis an odd political world where a blue-nest controlled council is opposed to competition. The change in policy comes after what was described as ‘a comprehensive consultation exercise’ — so comprehensive that only four organisations were consulted. The logic underpinning the policy is also, to be generous, poor. In all three cases it is plain that there is a significant customer demand for their services, otherwise they would not survived over a long period. In terms of location, that suggests that the stalls are conveniently placed for their customers. The desirability of the pitches from the commercial standpoint of the traders is not in any doubt. The question remains whether pedestrianised areas within retail developments are there for the benefit of shoppers and fixed retail premises or whether they are just another resource for accommodating additional commercial activity. If someone chooses to buy something from one of these stalls, does that not make them a shopper? If ‘resource for accommodating additional commercial activity’ is such a bad thing why bother with the town centre regeneration? Update: within a few days the doughnut seller has been granted a new pitch in The Parade. komadori has been lucky enough to attend two works Christmas meals this year: one at The Old Bank Brasserie and one at Fletchers Restaurant. Venues are rarely at their best when preparing food for Christmas parties, with the large numbers to be served resulting in something more akin to mass production than quality cuisine. This was definitely the case at The Old Bank. The ‘Cream of Carrot and Coriander Soup with a hint of ginger and garnished with garlic croutons’ tasted more like cream of cardboard, with the ginger and garlic indiscernible. For the main course, the turkey had been cooked into submission — it was stodgy and lacked texture. And whilst the stodgy meat was plentiful, the serving of vegetables was miserly. Worst of all was the ‘Rich Baileys bread and butter pudding, mixed with toasted almonds, cooked until golden brown and served with vanilla ice cream’. Well, yes it was cooked until golden brown and it was served with vanilla ice cream. There were also a few bits of almond. But it was neither rich, nor matching the description of ‘bread and butter pudding’. As the photograph shows, it was little more than a single slice of toast. At over £30 for three courses (excluding drinks), I expected far better. In contrast, Fletchers provided a reasonable meal at a much more reasonable price (£18.50). Pork, apple & Calvados pate with toast starter was fine if unremarkable. For the main course, roast beef with Yorkshire pudding, vegetables and roast potatoes was tasty though not overly tender. However, the meal ended on a high with ‘Chocolate Box Shortbread base topped with an indulgent Belgium chocolate mousse with a cream caramel centre’. That chocolate mousse was exquisite. The entrance to Il Capricorno on the High Street of Swindon’s Old Town does not look impressive. It is a narrow and inconspicuous. However, inside the restaurant widens out behind the frontage and seats around eighty people. The food served is equally unpretentious. A starter of Pate Campagnola was well presented and the taste delicious, though the lightly-toasted bread was a little late in arriving. The berry covering was perfectly done too, strong enough to balance the liver in the pate without overpowering it. The main course arrived promptly and in appearance was unpretentious to the point of plainness. The flavour fully made up for that. There was a generous quantity of well matured bacon in the Penne Amatriciana and, with a sprinkling of Parmesan and pepper, it was the most flavoursome pasta dish I have tasted for a long time. With a soft drink to accompany the meal and a cappuccino to finish, the total bill came to £16 excluding tip, though a different choice and a few extras from the menu could easily double that. According to their website, Il Capricorno offers ‘The finest authentic Italian food in Wiltshire’. It’s certainly the finest in Swindon. I’ve been to Pom’s Thai Restaurant in Old Town a few times now, but this was my first visit for several years and my first time at midday. The cooking at Pom’s is refreshingly light, by which I don’t mean that the food is insubstantial, but that the greasiness experienced with the fried dishes at many oriental restaurants is absent. Another feature of their lunchtime menu is that each main course is offered with a choice of chicken, pork, beef, prawns or vegetables, giving vegetarians a wide choice. With hindsight, I’d have gone for one of their ‘spicy’ dishes, as the ‘mild’ dish that I chose was so mild as to have no hint of spice at all. Nonetheless, as stir-fried noodle dishes go, it was nicely done, with the thin slices of beef well-cooked without being over done as is often the case with similar dishes at other restaurants. At £9.99 for a starter plus main course, it was certainly good value for money. There is one other feature of meals at Pom’s and that is the great effort they put into carving their vegetables. This wasn’t so much in evidence at lunchtime as it is in the evening, as a comparison between my photograph and that of the same dish from their website shows, but still adds some interest to what are quite large chunks of raw vegetable. At the weekend, whilst travelling, I stopped for my midday meal at the Fountain Inn at Parkend in the Forest of Dean. The meal was very enjoyable and tasty, but didn’t quite live up to its billing on the menu. I went had the steak and ale pie, ‘A rich, old-fashioned pie, topped with puff-pastry.’ Well, rich, yes, though a little runny — it would have benefited from the gravy within being a little thicker. It’s also true to say that it was topped with puff-pastry, but that’s the problem, it was only topped, no sides nor base. For me, ‘old-fashioned’ when applied to pie construction implies that the pastry encases the filling, not just tops it off in modern mass-catering style. It was very tasty, freshly prepared stuff, but more like chunky steak-and-carrot soup with a puff-pastry lid on than a real pie. The inn clearly does plenty of business from the local railway and the welcome was friendly and the beer good. It’s well worth a visit, just don’t expect the food to be as authentically traditional as the website menu suggests. I recently lunched at the Spag Bowl on the corner of Holbrook Way and Bridge Street. It is more a cafe than a restaurant, offering breakfast as well as lunch and dinner, and has prices to match. The food though is definitely of restaurant standard, and quite a good restaurant at that. The Pesto & tomato ciabatta for starter was pleasantly rich and light. The sauce on the main course of Amatriciana was equally rich, yet not heavy, being perfectly done and a fine savoury combination of bacon, onions and tomatoes lightly seasoned with herbs and spices. This is an establishment that clearly takes its olive oils seriously, it being the source of the richness mentioned and with over five being offered with their caprese. I’m not a connoisseur of Italian coffees, but that too seemed high quality to me, with a fine flavour and not over-roasted as is often the case in cheaper Italian restaurants. If you should find yourself in a queue awaiting entry to Cosmo just across the road, abandoning the wait and making the short journey to the Spag Bowl would be a wise choice. If you’re interested in fine food, you’ll not regret it. Would you like anything more to drink? I found myself oddly disappointed by a lunchtime visit to the Pagoda Palace restaurant this week. It’s not that there was anything wrong with the meal: there wasn’t. The food was good, in the English Chinese-restaurant style. The deep-fried cuttlefish dumplings for starter were exquisitely formed and the main course of chicken with black bean sauce and green pepper was tasty, as were the plain-fried noodles with beansprouts that I chose to accompany it. Other dishes sampled were of equal quality, though in the seafood dishes flavoured with ‘salt and chilli’ the former is rather too prominent. The venue is great, with a fine location overlooking a lake. Indeed, at an average of £18 for two courses, in comparison with other restaurants in Swindon at lunchtime, at least some of that price would appear to be for the location rather than the food. With the same price in the evening it’s distinctly good value. The service was good too, although the repeated enquiry ‘Would you like anything more to drink?’ was more that a little irksome by its fourth repeat. What let the place down though was that, of the twelve items that the group I was with ordered, three were either not available or, in the case of duck, only available if we were prepared to wait ‘one or two hours’. The Palace is a large restaurant, seating up to three hundred people, and their menu is long. At lunchtimes, when the number of customers is small (there were only three groups there when we visited, amounting to less than twenty people in total) they should perhaps offer a smaller menu, so that what they offer matches more closely what they can deliver.